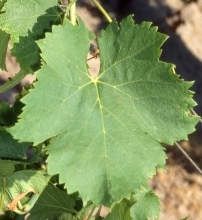 This vine variety is originally from the Savoie region and it does not correspond to the white mutation of Mondeuse N. It is a distinct vine variety. In France, Mondeuse blanche B is officially listed in the "Catalogue of vine varieties". Mondeuse blanche B is a trailing vine variety. This vine variety is not very susceptible to grey rot. Grape clusters and berries are moderate in size. 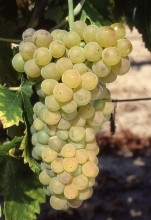 Mondeuse blanche B produces ordinary, fairly alcoholic (good sugar accumulation potential) and moderately acid wine. There are no approved clones for this variety at the present time.